I don’t know why, but recently I realized my design and making of a pictorial quilt has fallen into a multi-step method that can be shared with my readers. I suspect that most pictorial quilters work much the same, but each of us develops our own methodology and here is mine. It might work for you if you are interested in making such quilts. Work from the background forward. Here I am appliqueing on the pieces. Sew what do you do when you have a picture you want to make into a quilt…either you drew it yourself, you took a photo, you bought or were gifted the rights from another artist, or you bought a royalty free design from somewhere like Dover that grants permission to use it for artistic purposes (be careful to read the permision statement)? Plan by taking apart the project in your mind and writing down notes about how you plan to approach it. If you have worked in digital drawing programs like Corel Draw, Corel Painter, or Adobe Photoshop, for instance, you know you can divide a project into layers and work on each layer one at a time. You may also know that you need to think from background to foreground in how you approach a design. It’s the same here. Print or draw a full-sized quilt plan. I say “plan” rather than “pattern” because sometimes that’s all it is…just a full sized picture of what you want to make. But it functions kind of like a pattern. My current project is a Bayou quilt using another artist’s (Joel Christopher Payne, a Disney artist among other things he does) picture for inspiration (though I am using it for inspiration and a guide rather than trying to copy his work). Study your picture and analyze it for challenges, needed fabrics, techniques you might use. This quilt has many challenges. It has lots of old wood and cyprus trees and water at night, making texture really important and values more difficult. It has a lot of plays of light shining through the trees, playing out on the water, and fireflies. There are lots of water plants around the Bayou scene. Almost half of the work on this quilt is to be free motion yarn couching, free motion embroidery, and other embellishment work. This quilt background will start with extensive applique work. After the applique there will be a small amount of highlighting and lowlighting with various fabric paints. After the appliques are in place and some of the paint work then I will start with the couching and free motion embroidery work. I have figured out how to deal with the light playing on the water, but I am still not sure about the light coming through the trees…maybe veiling, which is on order. Along the way you may decide to use some trapunto to give some additional depth to your work. In this case, I will be adding a layer of wool batting behind the tree trunks, the cabin, and the old house boat. Building such a challenging pictorial quilt for me sometimes involves testing a technique on a scrap first and then working that part on the quilt, but sometimes I have to change my mind on how I will approach a particular part of the quilt. Then I have to do the sandwiching, squaring, and quilting that every quilter has to do. So I now have all the appliques on and have done some of the highlight/lowlight work. It’s ready to start the couching and free motion embroidery. This picture is taken from standing over a table, so it isn’t front on like I’d like. This is like layer two through ten of a 32 layer digital drawing…lots of work left to do…it’s kind of a background at this stage. LOL And besides, this is just a small part of it…it’s 60 by 30 inches overall…at least that’s what I’m hoping for in the end. Sew happy everyone! Take a plunge and try your own pictorial wall quilt. Be patient with yourself and realize almost every problem can be overcome in achieving your vision. Sometimes the problems are really a blessing…they give you new ideas. Tags: Don't give up without trying something else first, Having fun in my studio, I love comments., Scary and exciting all at once, Thank the Lord for all the cool things we have to work with today, What is that crazy B.J. doing now? I am enjoying a new fabric adventure into the world of exhibiting of the body of my art quilting work at G Street Fabrics in Rockville, Maryland, which is a two-part exhibit. 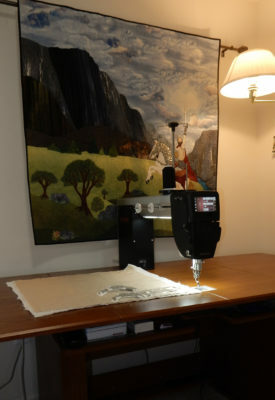 The first part is in the Bernina section of the store. The second part will start in mid-July and my quilts will be displayed throughout the store. I believe this part will run for an additional two months and I am hoping to complete several new quilts for this part. So in effect, my quilts will be on display from now through August. Yesterday I took eight of my quilts over to the store for part one. This part includes all three of my Ancient Manuscript quilts, four of my Hoffman Challenge quilts that demonstrate my growth as a quilter from 2008 to 2013, and Dad’s House Plan from 2013. I had such a good time while I was there and am very excited about this two-part exhibit. I am honored that G Street Fabrics wants to do this exhibit for me. 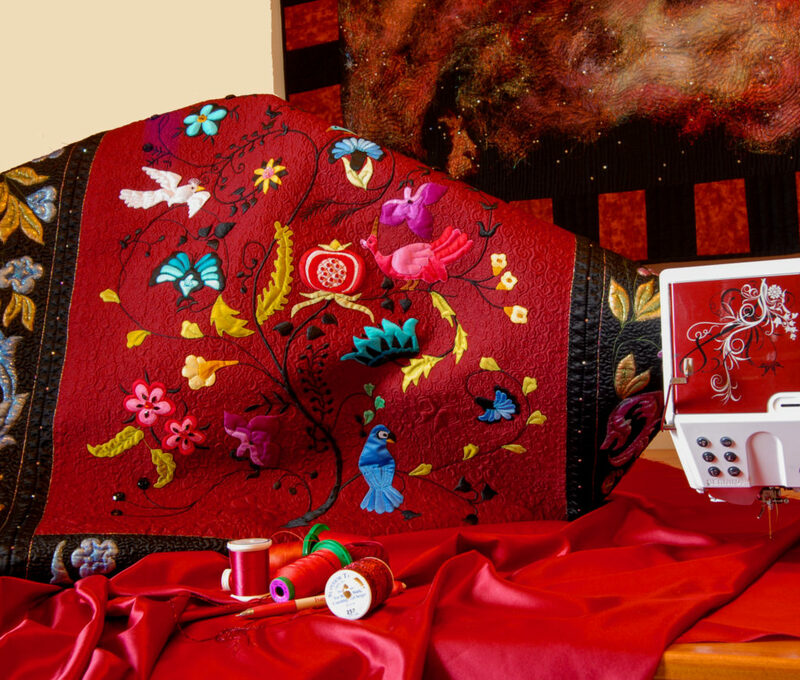 In June, I will be teaching a three hour workshop on quilting there at G Street…primarily free motion quilting but I am also going to briefly talk about quilting with a walking foot. Sometime while my quilts are there I will be providing a walking lecture around the store to talk about my quilts and related things in the store. G Street is a wonderful store. It is getting better all the time after it clearly moved to save itself from failing. It closed two stores in Virginia to my chagrin and moved from it’s old Rockville location to its new one. The new store is less showy and slightly smaller than the old Rockville one, but I looked over it yesterday and found it has a fine selection of fabrics and notions and seemed busy again. It also has a kind of interesting atmosphere similar to some fabric stores I encountered in New York years ago…not flashy, but full of wonderful things for the sewist, quilter, and fabric artists of all kinds. The Bernina section is in a setting like its own store, and it has a wonderful set of classrooms for teaching. 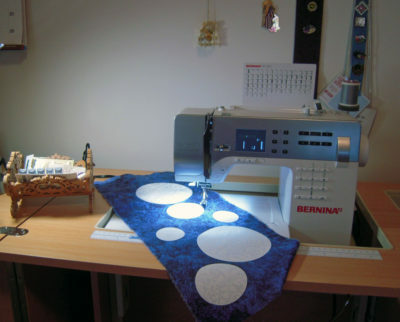 They have a Bernina Q24 longarm set up in the store that is available for in-store rental of time on the longarm. And Lew is the best Bernina tech I have ever encountered over my many years of sewing on Berninas. I encourage you to go pay it a visit if you are ever in the area, or even make a trip there if you are close enough. You can even order from them online. Sew happy everyone! I hope you can make it to G Street and see my exhibits. I better get to work…I have several new quilts in the works for the second part of the exhibit! Tags: Scary and exciting all at once, Thank the Lord for all the cool things we have to work with today, What is that crazy B.J. doing now? 2008This is my very first show quilt and you can see the scotch tape on my photograph…LOL. So you can see my professional side of show quilting has grown as well as my quilt making abilities. As I prepare for my upcoming exhibit of my work at G Street Fabrics in Rockville, Maryland, one of the things they wanted was for me to provide my Hoffman Challenge quilts, which, if you look at them carefully, you can see my progress as both an artist and a quilter from year to year. Unlike some of my quilty friends who make a quilt, enter it, and win big, I have struggled, indeed still struggle, to move my art quilting to a truly professional level, but it has been fun along the way. I love making art in fabrics, threads, and paints. I think my artist side has been a little slower in developing than my quilting techniques, but I’m working on it. Even though I can now see many flaws in both the design and the quilting making techniques on this quilt, I still love it. I would never send this quilt out for show today, but we all learn. 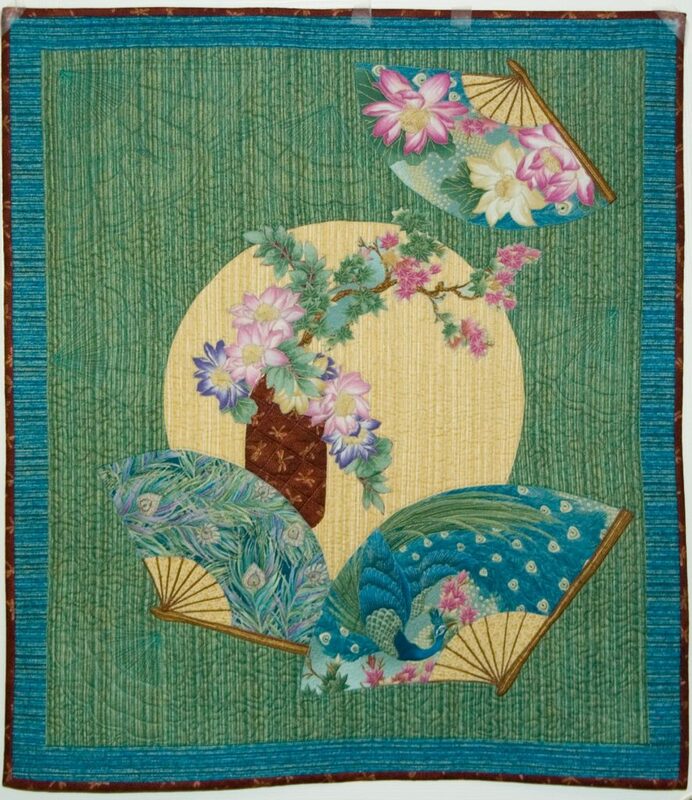 They let it into several shows and the judges were sweet about it and their remarks didn’t bash me down to the point I quit quilting. Unlike this photo, it is square and relatively flat, though I had to undo a lot of it to get a wave out of it. You can see it was not all that long ago. I have come a looong ways from here. If they had torn it apart, I might have quit. To me, an art quilt needs to have a lot of elements come together to make it good and this is what I am always striving for. Starting with the basic design concept I draw the concept while considering balance, value, color, placement, perspective, and simply artistic appeal. I am constantly attempting to learn more about all this through practice, books (some left from art classes in college and some collected over the years), and, more recently, online training. I’m still trying. So here is my process for a complex show quilt (not for all of my quilts). 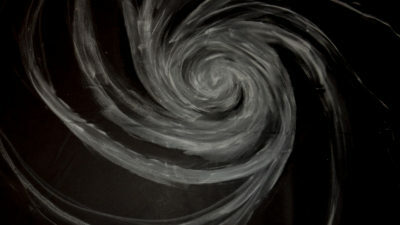 I try to capture the concept that is in my head or the inspirational photo by drawing the picture of the planned quilt on my computer, thereby providing me with a “pattern” . Here is how I work through this. I use Corel Draw to draw out some elements, like buildings or space ships, and saving them with a transparent background as a .png file, which will import into other packages without a background. 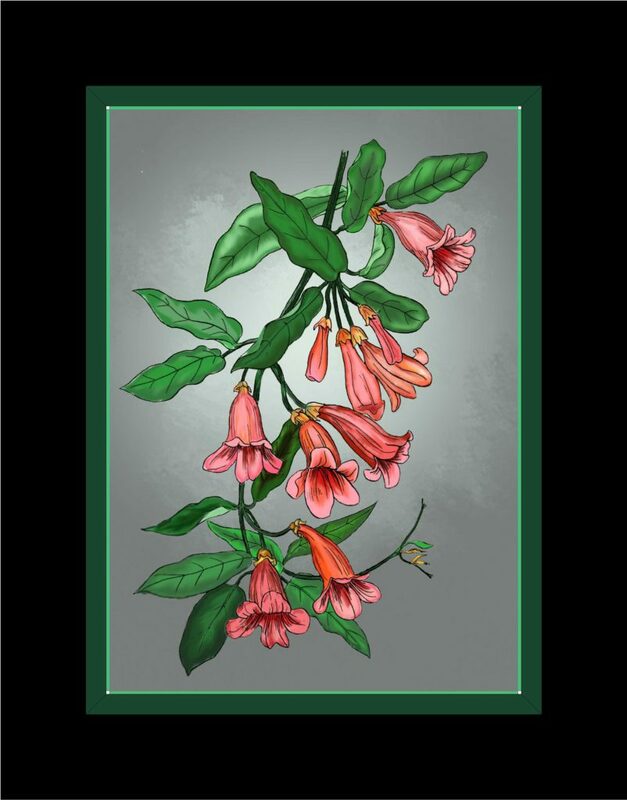 I use Corel Painter, a truly powerful digital painting software, to draw the main picture, importing the items from Corel Draw and placing them where they belong. I size it here and save with iterative painter files and finally as a .jpg. I may go back and forth between Corel Draw and Corel Painter several times because one program is better than another for various things. If I am putting borders on the quilt I will then move to Electric Quilt and set it up with a single block sized properly for my .jpg. Then I play with the borders until I like them. This gives me the pattern for the borders. I save this as a .jpg. I move back to Corel Draw and start a new file (you can’t just open a .jpg in Corel Draw, but you can import one). I import the design I saved in Electric Quilt into Corel Draw and size the image to the size I want the quilt to finish. Corel Draw has a wonderful way of tiling the picture into sizes that match the printer paper with symbols to mark where they join. I usually print the pattern on a 11″x 17″ paper. I print one pattern in color and one in gray scale. I also print the border pattern from EQ7. I tape the pattern together carefully. Then I pin the colored print on my design wall, or tape it somewhere if that is occupied, and sit there looking at it every now and then, wondering how on Earth I am going to accomplish this quilt. At this point, I take time off from this particular project if I have time. This is why I usually have some ongoing simple quilt or clothing projects so I can go work on something else while the concept “marinates” in my mind and I talk to myself…sometimes exclaiming “Oh THAT’s what I can try!” I’m glad my son’s flat is on the lower level, and is not in my studio to hear me, he might be looking for “a place for Mom”, although, he’s a sci-fi/fantasy writer so probably not. I keep a notebook nearby to write down my ideas. Once I’ve figured out more or less how I’m going to make the quilt, I just jump in. I first shop my stash to see if I have what I need for this quilt and buy the rest, including fabrics, threads, paints, and other embellishments. After all my years of sewing and quilting my stash is now such that often I am able to complete a quilt without buying anything, or buying only one item. It generally takes me nearly half the time of total time making a quilt to get to this point. I have to take one or two elements of the quilt at a time. I make samples and try things until I find what works. I have to figure what must come first…usually working from background forward. I take photos along the way because for some reason I can see mistakes better in a photograph than directly looking at the project. I think I get too close to it, as they say. I unsew and go backwards when I need to, but try to limit this as much as possible. Sometimes “mistakes” are actually result in a good new direction. I’m not a piecer, but sometimes I have to piece. “Pendragon” had the main center block, and ten border and text block pieces that all HAD to be square and straight and the border had to be lined up so the designs were straight and in the right place. This is one of the more challenging things for me, because, did I say it? I’m not a piecer. Piecing is much more challenging to me than it must be to traditional quilters, who seem to love it. I piece when I have to in order to realize my design. I sometimes use foundation paper piecing when I need a real quilt block, like I did for “Waiting…” and “Drawing Nigh”. So I’m very happy to have these tools and techniques to help me piece. Sew once I have completed the top, including any highlighting or lowlighting I do with fabric paints and inks, I sandwich my quilt mostly using basting adhesive and rulers to get the lines that need to be straight and square right and adding some quilting pins because I use a very light amount of adhesive spray on the batting only. This is my least favorite thing of making a quilt and I find it physically taxing, especially if it has to be on the floor because of size, and I wear a mask and often have to do it over and over again until it is right. Then I quilt it, bind it, add a pocket, a label, and block it. My oldest son Ken photographs it at his home in my daughter-in-law’s wonderfully big studio where her longarm and her Bernina 880 resides. Beth was, afterall, the one who pulled me into quilting after Marvin died because she was sure I would love it. I’m not sure she expected me to love it as much as I do, and I know she didn’t expect me to move into the art quilt world. Before this happened, I had made several pieces of fabric art, had sewn for most of my life, used to have my own fashion design and tailoring business, and made my own clothes and some of Marvin’s. I found art quilting simply unleashed and pulled together all the sewing and art skills I had learned in my life, but I did need to learn a lot before it was any good. And I’m still learning, experimenting, and moving through art quilting. Maybe someday I’ll start winning the big ribbons (I have won a few ribbons, but no BOS). Sew are any of you making our free design art quilt with me introduced in my last blog post? How’s it coming? I’m not rushing you. It will probably be another couple of weeks or month before I get to the next step. I’m preparing for my exhibit and I figure the first step is a big one. Tags: Don't give up without trying something else first, Having fun in my studio, I love comments., Scary and exciting all at once, What is that crazy B.J. doing now? I am making a fun new design-as-you-go stylized landscape quilt with some kind of flying creature and I hope you will try one of these too. For as many steps as it takes (to be determined) I will be providing a blog post to take us through this quilt together. This quilt is made without first drawing out and printing a full sized design and will be using techniques that I am sure you may wish to try or have tried already. I am not providing a pattern, telling you what size it will be, or even tutorials for all the techniques needed. This is a project for us to play together making some wall art. I will tell you where you can find the techniques, providing the links, and for some parts I will give tutorials, but not all. It can be as simple or as complex as you want to make it, with guidance as to where you can find help. And if you have a question all you have to do is make a comment on the blog post and I will respond as soon as I can. I am using some interesting techniques available online at Iquilt and Craftsy. But you don’t have to take a class for this project, just follow along. If you have Electric quilt 7 and know how to do foundation paper piecing you, or you already know how to make a compass block, you can do this without additional classes. For this fun project there are several objects we will need to make and obtain. 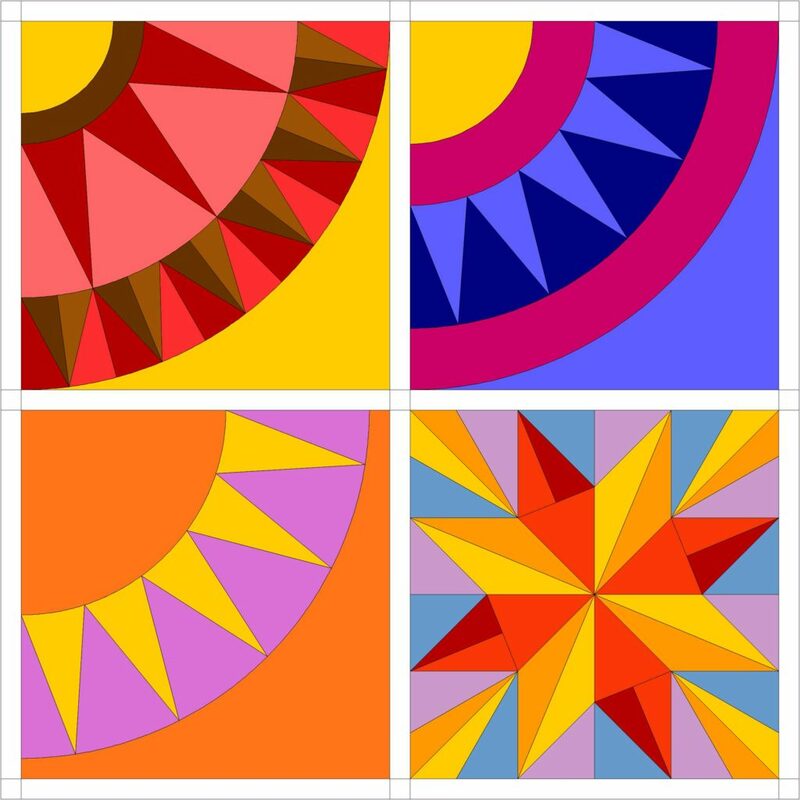 Challenge–Make The Sun: This can be either a simple quarter of a large circle of fabric to applique on a sky or one quarter of a sun compass block or a smaller full stylized star block in your choice of sun colors for your imaginary world. For my quilt I am using the star block that Karen K. Stone teaches in “English Paper Piecing by Machine” found on iquilt here. It’s very similar to a regular compass block, but has some interesting differences. If you watch the sales, you can almost certainly get this class on a very good sale. But there are a lot of beautiful choices for a star to represent our own star, the sun. Here are some I found on Electric Quilt 7 that would be great choices with some color changes. The outside large piece, or the background pieces need to be made from the same fabric as your background sky piece (see below), or you can use the curve to applipiece or piecelique (whatever you call it…it’s just joining the two pieces in an applique manner) it directly into the background sky. I will provide a little tutorial of this in my next blog related to this project. So just hold off on attaching the star/sun to the background sky. These blocks were all found in Electric Quilt 7 and would work very nicely. You can change the colors, of course, however you want them. In addition you could draft your own compass rose. I found this fascinating method on The Quilt Show that uses a really neat drafting device available from Renea Haddadin’s website here. I don’t have this device, but it really looks useful far beyond the drafting of a compass rose. Put together the background: For this you will need a full width of ombre gradiated fabric that will be one third of the length of your finished quilt, or just a plain piece of fabric that looks like a sky to you. You can paint this, buy this, or construct this with strips of various pieces of fabric. You just have to size the sun appropriately to fit in the upper left corner of the scene. Two thirds of your quilt will be mountains and maybe water or grass somewhere in there. 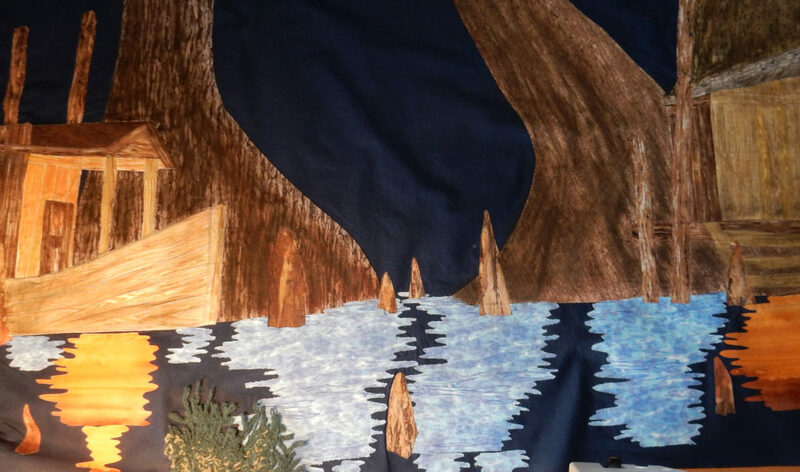 If you want to make this easy, you can use a simple white or off white or even light brown or green for the lower two thirds of your quilt background, giving you a background to applique mountains and rivers and plants onto. Remember, this is a design as you go quilt and is meant to be just for fun. Wait to applique the sun in the upper left corner of your background until my next blog when I will be discussing applique techniques. Okay, that’s all for now. Go forth and make a sun and gather the background pieces or even make the simple background. 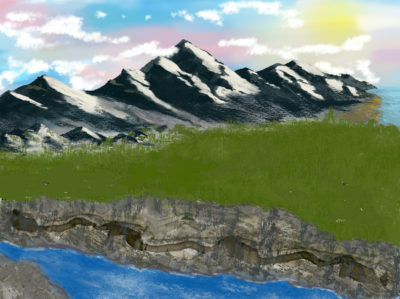 The next part will deal with appli-piecing the sun into the sky, and making the mountains and other parts of the foreground. Then there is a part for making plants, and finally we will make some kind of flying creature for our scene, which may take several parts. I plan on following this with a series of blogs focusing on embellishing and quilting. I am not calling this a “block of the month” or anything, but I am planning this to stretch across several months…not sure how many. Sew happy everyone! Do some thinking about this…join me in the adventure and make your own wall quilt just for fun and to stretch your design techniques a bit. Tags: Don't give up without trying something else first, Encourage new sewists and quilters, Having fun in my studio, I love comments., Scary and exciting all at once, Thank the Lord for all the cool things we have to work with today, What is that crazy B.J. doing now? Happy 2017: A New Year Full of Promise and Opportunities!!!! I don’t know about you, but I’m very excited about the promise and opportunities this new year brings. Right away in 2017 I have a batch of really exciting new projects all ready to start and several very interesting projects close to the finish. My sons, daughter in law, and grandson all have made me proud and their future for this year looks really promising. I even have begun to make some progress already on my plan to lose a lot of weight, which always seems harder for me than most. I am grateful and thankful to my dear Lord for all He has done for me. I am first of all finishing Ken’s quilt, and then making several fun quilts that will be simply for my spring exhibit at G Street Fabrics in Rockville, Maryland and then for sale…not necessarily for shows. One book is well along the way and two are outlined and started. The next thing is to make a bunch of samples for these books. And I will have to make some new clothes if I actually succeed in my weight loss program, but that will probably be in the second half of the year. This is a preliminary design of one of my quilts for the exhibit based on the digital flowers in the middle that I have spent several weeks painting in my spare time and finished today. I plan to have the central section printed on fabric. The borders will have a little more to them. Sew happy everyone. May you have a wonderfully blessed and productive 2017. Celebrate! Tags: I love comments., Scary and exciting all at once, What is that crazy B.J. doing now? Gloomy feelings are prevalent in the quilting community recently at the announcements of the closures of several quilt-related magazines and businesses, or parts of businesses. I was recently talking with a close friend of mine about this. These things have a way of being self-fulfilling prophesies by making people hesitate to dive in and do things because they think the industry is closing and they don’t want to invest their time and money in a failing pursuit if supplies, or when fellow quilters might not be around. Linda Thielfoldt captured it well in her blog post in which she ends up by calling on us to mentor a child. Sew let us think about this a bit and brush the dust off of our dreams for making that piece of funky or pretty art for your wall, a well-tailored jacket, a set of decorative pillows to spruce up your living space, a really nice outfit to wear to special occasions, some new pot holders, or how about that costume for your favorite fun festival or party. Sewing and quilting can be calming and also a fun adventure. I’ve actually seen recent comments from quilters or sewists criticizing other sewists for the way they shop or buy a class, or blaming problems on the “aging” quilters, who, they assume, don’t buy anything anymore (WRONG!!! ); or on young sewists and quilters who have very little time and not so much money so they pull learning and patterns from where they can. Such comments are not helpful. I call upon these naysayers and those who are worried to welcome all manner of quilting and sewing into our folds…the costume maker, the art quilter, the modern quilter, the traditional quilter, the tailored clothes maker, the hat maker, the bag maker, the doll maker, the sewist who makes items for charity, the ten minutes-at-a-time stitcher, the incredibly talented hand stitcher, and those who do all of these things just because they can. 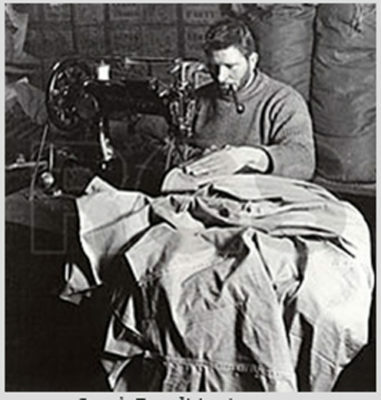 Sewing and quilting is an adventure, an occupation that takes our minds off of the difficulties of life, the politics, the horrible things happening in the world, and gives us the opportunity to think about how to construct that tote bag, or make that art quilt, or tailor that jacket to wear to work. In the end, moreover, we often end up with something truly wonderful. I do also hope we can stop categorizing the sewists of this world into preconceived ideas in a way that may limit opportunities. 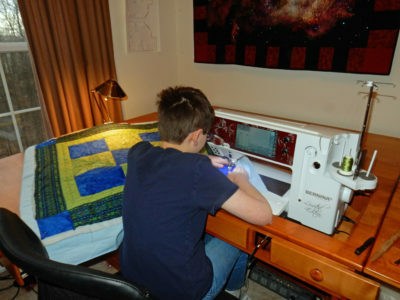 The younger quilter is not always interested in modern quilting. The older quilter is not always interested in traditional quilting. The middle-aged quilter is often ignored in discussions of this type. 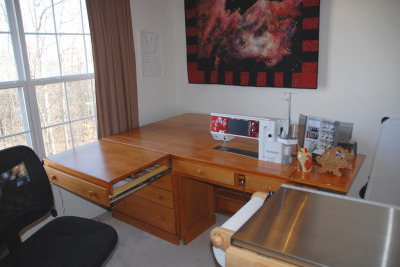 The art quilter is often as committed to excellence in their craft as the traditional quilter. Some people have jobs or other responsibilities that don’t allow them time to take half a day to shop or go to that show. 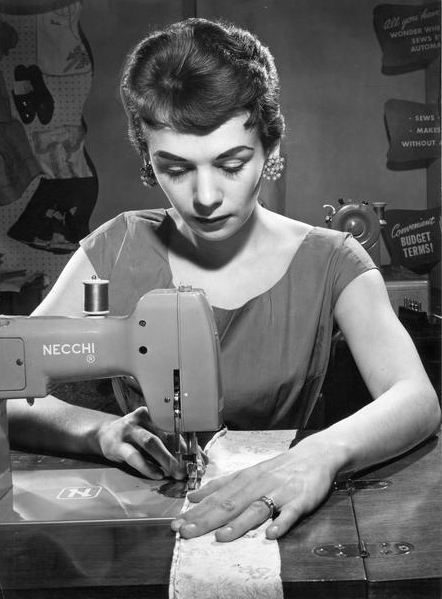 Sew, wonderfully, they download classes (some of which are wonderful and thereby they support that teacher), they order on the Internet (maybe even from their local fabric store)…but they order and they take classes, they buy that fabric and thread and machines. This activity will keep the industry alive even if it doesn’t help our neighborhood fabric store with the owners who have been in business for decades and are ready to retire to do their own sewing. I hope we will continue to support each other and encourage the “ancient quilter” making something spectacularly different, the middle-aged man sewing a vintage costume, the college student making something for their dorm room, or the twelve year old boy quilting. Let’s keep this industry alive with enthusiasm even as it changes to encompass the new methods of communication and shopping! Sew happy everyone! I loved Linda Thielfoldt’s blog about mentoring new young sewers. This is important. Might I suggest, also, that it does not just have to be a young person (though, again, this is important)…an older person with a little more time and money on their hands might also want to get in on the fun and then pass it on to their young person. I approach show quilting as an adventure (hence the words “Adventures in Fabric Arts” found on my blog heading). 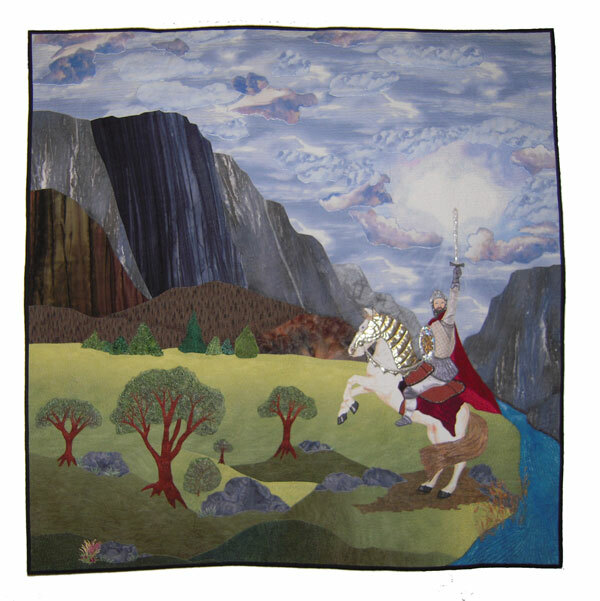 Every show quilt I have made to date has been designed entirely from my own vision, or inspired by copyright free photographs interpreted by me, or my own vision enhanced with elements from royalty free sources such as Dover Publications. I so far don’t use other people’s patterns, which I realize are often a wonderful way to approach quilting, and many people make magnificent quilts from patterns and add their own spin on them. 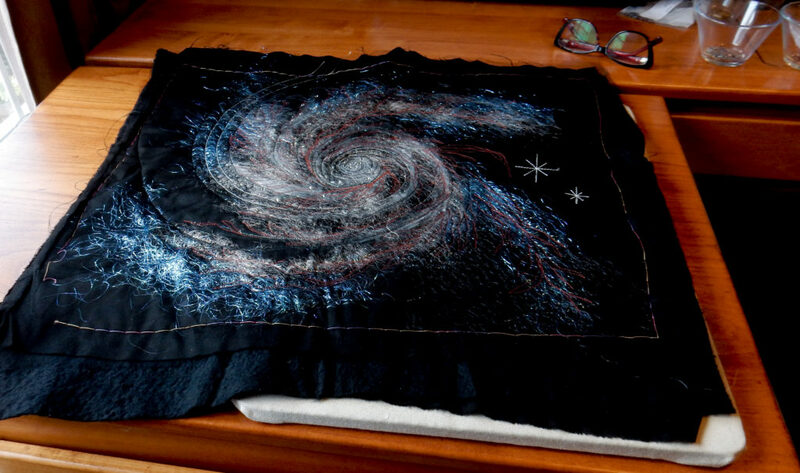 I admire these quilts too, but for me, I love my adventure in quilting. Then I tested the threads for the quilting on this, which allowed me to make the decisions needed for both the threads and the quilting patterns/fills (see this blog post about making my deadline, in which I discuss these choices). 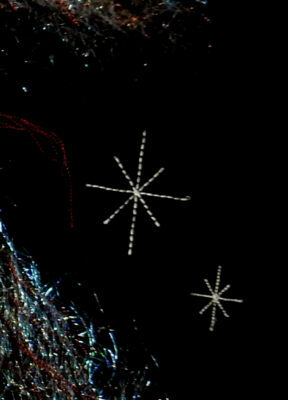 I also tested the spires behind select stars that I designed in my Bernina v7 software and stitched in the hoop. 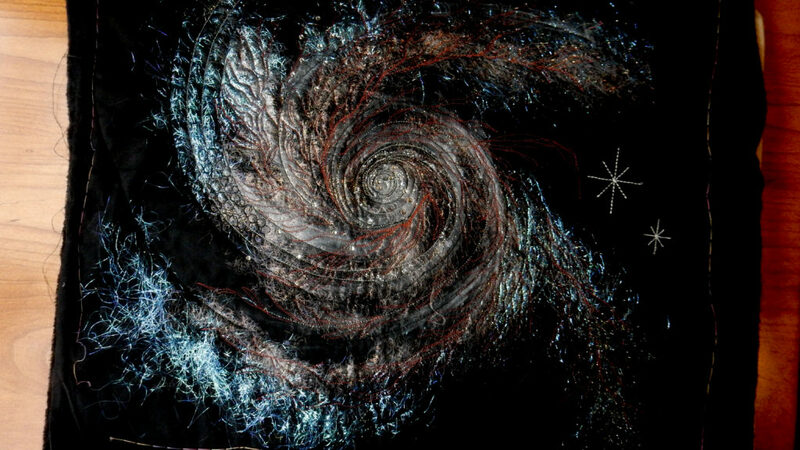 Today, I am thinking of adding some fabric glitter paint to the very center of the spiral to enhance the look of my homage to the magnificent spiral galaxies created by God and photographed and processed by NASA that have so inspired me. So I am testing that on the study piece. So here you have the overall test/study piece, which is very roughly 15″ x 15″. Over view of test/study piece. Sew I encourage you to include test pieces in your quilt making. They can save you a lot of mistakes, picking out, restarts, and headaches of all kinds. Sew happy everyone! 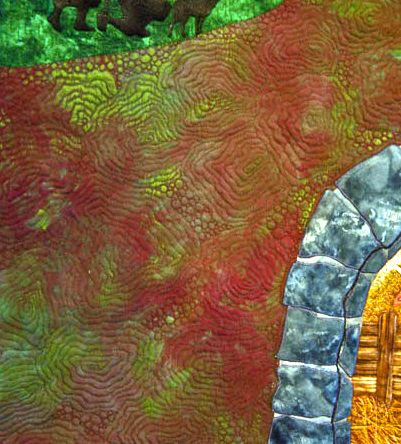 Develop your own adventures in fabric art, but be sure to start with a small study piece. Tags: Buy David's new book and you will have a fun read, Having fun in my studio, I love comments., Scary and exciting all at once, What is that crazy B.J. doing now? I always need to work at coming up with how to quilt my landscape and pictorial wall art quilts, as I suspect most quilters do for their quilts. I went through the recent past couple of years thinking I needed to learn a more formal quilting style and to avoid the natural flow of organic quilting patterns that came to my mind when looking at a landscape or pictorial quilt. This probably stemmed from my observations of the details of winning quilts at major quilt shows where the quilter had often used a very formal style of quilting even for pictorial or landscape quilts. This is a fine way to approach it and probably entered in to the judges’ decisions to award the quilt a ribbon. But for my quilts, I truly prefer a more organic approach, though I do admit there are places where formal quilt patterns would be in order. As of this writing, I am currently in the process of quilting my Hoffman Challenge quilt for 2016. 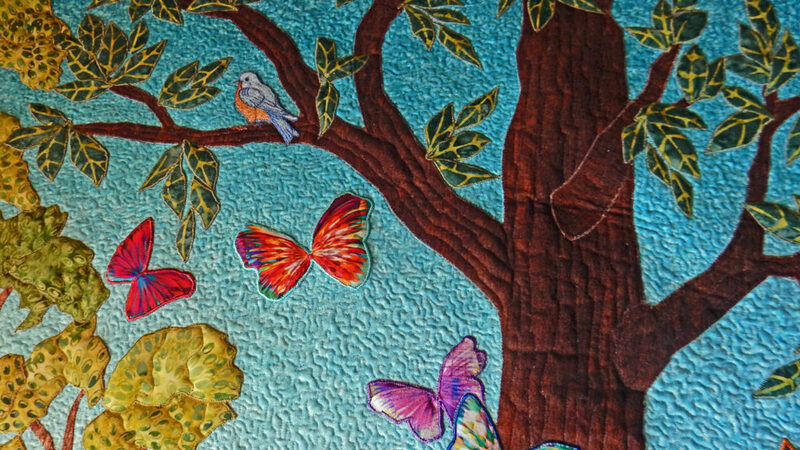 This quilt is heavily appliqued to form a whimsical pictorial quilt of a fantasy forest path with trees, birds, animals, and butterflies. Since it is so heavily appliqued, it has only small spaces in which to develop any formal types of quilting patterns. 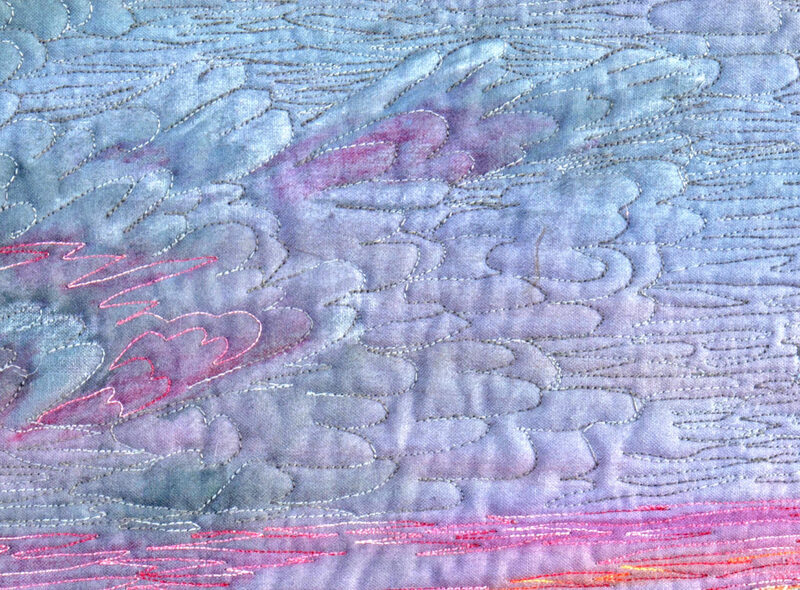 I struggled for some time trying to come up with a good sky pattern for a quilt where the sky is supposed to be sunny and calm…not a lot of wind and no approaching storms. Believe it or not I found this harder to decide on than I did the “sculptured stormy sky” quilting that I came up with for Drawing Nigh. In the end, I decided on a simple meander using a 100 weight silk. It makes the sky recede into the background without implying wind or clouds, and brings the appliques to the foreground, exactly like I wanted. It’s not perfect (my quilting almost never is), but it seems reasonably good also. This quilt is still in process…for instance, the butterflies don’t have their antenna and beadwork yet. The leaves on the big tree aren’t quilted yet. But this pic shows how the simple meander pushes the sky back where it belongs and brings forth the appliques. I quilted the big tree in a simple bark-like line. For past quilts, like Noel, I have also struggled to find just the right pattern, or in truth, fill, that maintains the organic feel of the area and still provides enough added interest. (This quilt won a Honorable Mention in HMQS 2013). Mossy side of the cave where the Nativity Scene is pictured within. For me, it helps my end results to keep it simple, and for these types of quilts the shapes need to be organic and easy to use around complex shapes. I think every quilter needs to develop their own style that suits them. I am pretty sure it does not mean that you have less skill if you use organic shapes, although I think some judges think that, but it is an artistic design choice. Some of these organic styles actually require considerably more skill than you may think…for instance large areas of simple meander should be as evenly and appropriately sized for the project as possible, which is not always easy to do. You also need to figure out if the areas are so large they need breaking up with something for interest sake (wind creatures or clouds, for instance). I hope that judging is moving toward an understanding of this. Nevertheless, I think that I will continue along this path, though I do think I should do a formal quilt at some point. I have something in mind. Note: My Bernina sitdown longarm is arriving next week, perhaps Monday, followed by a day of set up and training by my dear Bernina dealer and friend Mei Ling and my magician tech Lew. I hope very much that this addition to my machine family will not only help my other machines last longer, but provide me with a higher level of quilting. It seems possible it might also speed up my quilting, since the stitching speed is twice that of my Bernina 830, but that is not a given. After an enormous reorganization effort of the whole upper flour of my home, I have a wonderful space for the new machine, a nice space for my smaller Koala cabinet where i use my purely domestic machines, and maintained my big cabinet space for my 830 that I also use for cutting clothes and other projects. This reorg has already brought many positive changes to my studio that I probably should have done earlier. I’ll post pictures when everything is in place. Sew happy everyone! 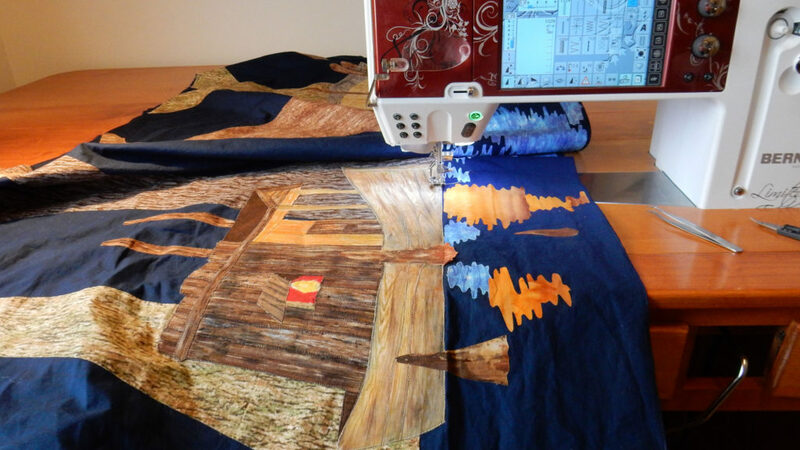 Try some organic free motion quilting for your next landscape scene. Tags: Buy David's new book and you will have a fun read, How fun is this!, I love comments., I must be crazy, My word high end machines are expensive!, Scary and exciting all at once, What is that crazy B.J. doing now?